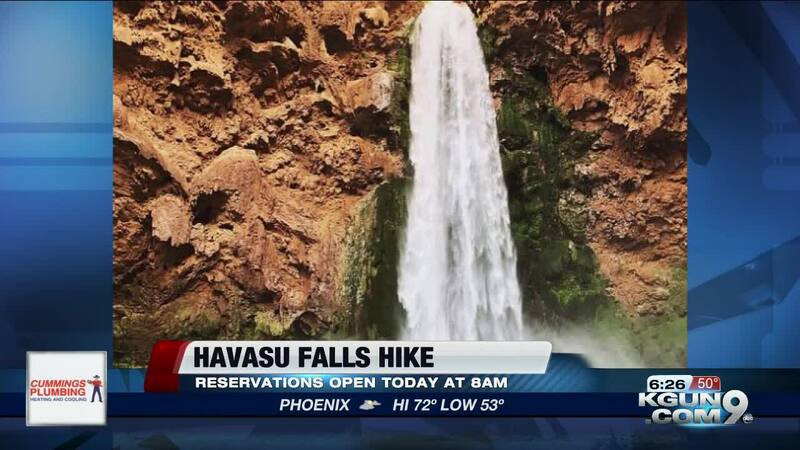 Havasu Falls reservations for all of 2019 will begin on Feb. 1 at 8:00 a.m.
TUCSON, Ariz. — Havasu Falls reservations for all of 2019 will begin on Feb. 1 at 8:00 a.m.
To increase your chances of getting a reservation, the Havasupai Tribe recommends setting up an account now on its website . "Since the entire season completely sold out almost instantly on last year's Opening Day, be sure to create an account now - and then come back, sign in to your account, and be ready to go by 8 AM on February 1st when the reservation calendar for the entire 2019 season opens up," the website says. All visits require a reservation prior to arrival. Pricing for 2019 has not yet been finalized. Located within the Grand Canyon, Havasu Falls takes hikers on a 10-mile hike that leads to a series of awe-inspiring blue-green water falls. For more information, visit theofficialhavasupaitribe.com .